Description: Two Amtrak GE's, in two different paint jobs, pull an e/b through Leetsdale, PA. Looks like alot of mail on the hind end. Description: Roaring down the siding at 12:43 PM. Description: After about a 2 hour wait, our first train appears. P091, running 90 minutes late, eases to a stop at WPK. Description: AMTK Crescent #20 with Toyota Tundra painted second unit crossing Hwy 82. Date sometime in 2005 I believe. Description: neat surprise of catching the auto train today wtih BOTH engines 1 and 2! Title: What the Engineer sees. Description: Amtrak Train #370 arrives at the St. Joe depot. Photo by Russell Sekeet. 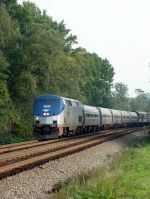 Description: Amtrak 370 pauses at St. Joe. Photo by Russell Sekeet.